Posted on May 30, 2008 by "No Longer Mass Emailing"
Under 6 foot 3 or under 230 pounds. Age does not necessarily matter. Actually, the older and sweatier you get (goggles preferred), the better. In fact, when leaving the court as an old sweaty guy, you’ll want to make sure to start up as many weird 10 second conversations with the next group of people entering the court. It makes things very comfortable for all parties involved and gives the aforementioned group something to laugh/talk about as they begin stretching before the game. Now, to the story – as the fam and some friends know, I “tweaked” my back awkwardly playing racquetball. 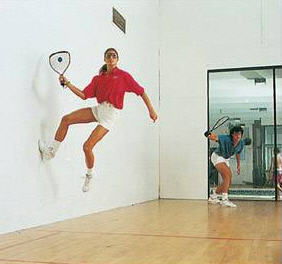 Yes, racquetball. I’m a meat and potatoes guy and I usually stick to the normal core sports like football, basketball, baseball, etc. but I’ve been “conned” (I say that jokingly Andy, Mack, and Shawn) into playing racquetball over the last few months. On a positive note, racquetball was fun at first and actually relieved some stress. So, my adventures on the court started with a borrowed racquet and a few weekly sessions at the Y that were enjoyable yet always led to some sort of soreness the following night and/or day. But, since I dreamt of becoming a star like Sudsy Monchik, I bought the $49 racquetball package he personally endorsed and even mailed away for the free instructional CD-Rom. I’m not sure why, but, mailing away for the CD sort of felt like Ralphie in the Christmas Story with his Little Orphan Annie Secret Society decoder pin. A month or so ago during an “intense” game of hitting blue balls (ha, ha) against a wall and chasing it around, I thought I just pulled something and it would get better like it always does. The next day (Friday) I was really sore but by the following morning (Saturday) I was ready for some more racquetball action. After the heated match, my car got towed because I paid to get in the Y lot, it was full, so I parked in the fire lane. Yada, yada, yada….I woke up Sunday and wanted to die but at least I could walk. A week later I couldn’t walk. That is, if normal is being able to sit in one position for less than an hour, working on my knees for at least a few hours a day (ha, ha again), stretching every 1-2 hours, laying on the floor to eat meals, and working/blogging/watching tv in a similar position. But, I can now walk a few blocks without pain (medicine?) after stretching so that’s good. companies appear and disappear leaving the clientele behind.